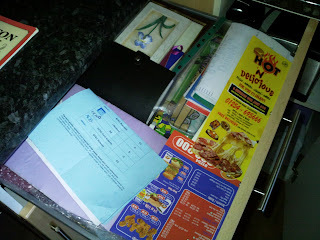 I've just had to search for a piece of paper that I knew was somewhere in the house; it was most likely to be in the 'Junk Drawer' in the kitchen. 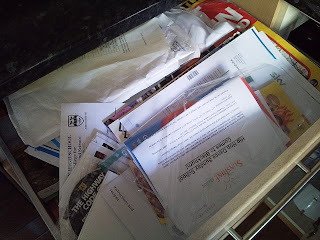 If anything is lost in this house the first place to look is usually the Junk Drawer and I bet almost every house has something similar. Photos (printed out but never used in a collage that I was making), Christmas present labels, a Gold snooker club membership card (mine), bubble wrap and envelopes of varying sizes for eBay, a mouse mat that is no longer used, numerous take away menus, four maps (2 for Great Britain, 1 for the Forest of Bowland & Ribblesdale and 1 for Preston & Blackpool), a CD-Rom version of the Highway Code, a book of old views of Preston, 2 Orange sim cards (never used), 2 bingo dabbers (well used), a consent form from the hospital from when my son had nasal surgery last year, a nasal spray used after said surgery, a bag of Post Office receipt from a selling spree on eBay about 14 months ago, a webcam disc and manual (we no longer have the webcam), instructions for the digital timer on the lizards' vivarium's, the instruction booklet for our new George Foreman grill, various bills (council tax, gas, water), The Complete Guitar Player Book 1, the newspaper pull-out section from 2007 with my daughter's GCSE results in, a copy of an article from when Prince William visited son #2's school last year, son #1's mock GCSE results, various school reports, a revision guide for son #1, an emergency birthday/party present and label, an 'activities for young people' leaflet, son #2's British Amateur Gymnastics membership and associated information, 3 cross-stitch projects to be displayed or given as presents, a pottery tile picture of a flower, an unused index folder, an empty photo frame, various certificates from school and two sets of autographs from the dance group Flava. I never did find that piece of paper... but I managed to have a bloody good clear out!! So just to make sure that I'm not the only person following in the footsteps of Mr Trebus, I would like to ask three people to "show me their drawers". They then have to ask three people to do the same and pass this on in the traditional meme style.